Even the greatest performers need rehearsals…and JET is no exception. Scientists and engineers at the world's largest fusion research project have been preparing for JET's next starring role – a run of tests using the high-power fuel mixture of deuterium and tritium (D-T). The deuterium-tritium combination is the one that will be used to gain maximum fusion output in the next-generation international experiment ITER and the first fusion power stations that will follow it. 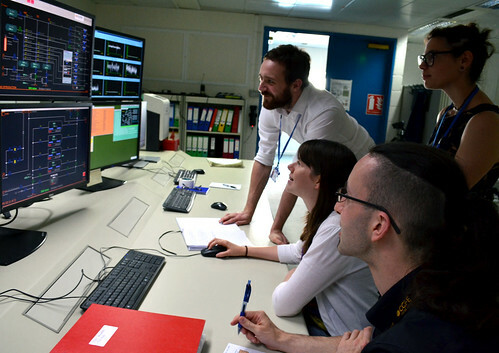 JET is the only present-day fusion machine that can use tritium and therefore has a vital role in preparing for ITER operations. As a radioactive substance, and one that is in short supply, tritium is not used very often at JET – most research is carried out with deuterium only. The last operations with tritium were in 2003. However new sets, or ‘campaigns', of both T-T and D-T experiments are planned in 2018 and 2019 to give the best simulation yet of how fusion plasmas will perform in ITER. The D-T rehearsal at JET during this summer and autumn aimed to simulate the operating environment for the tritium campaigns. With 13 years since the last tritium experiments, many of the systems and the people working on them have changed. The rehearsal was an ideal opportunity to test procedures for using tritium, train staff and iron out any flaws ahead of the real thing.